In less than two weeks, we’re starting a total overhaul of our master bedroom. Right now, it’s super generic, and frankly, quite a mess. It’s become a gathering spot for extra furniture and still has an empty wardrobe rack from the closet makeover. And whoever said clutter attracts clutter was SO right! As I’m working on the plans for our room (which I’ll share on 4/7), there have been a few bedrooms that have inspired me. Although, my “Bedroom” board on Pinterest is up to 600 pins, so maybe that’s more than a few? Anyways, here are the spaces I’m most smitten with this week! 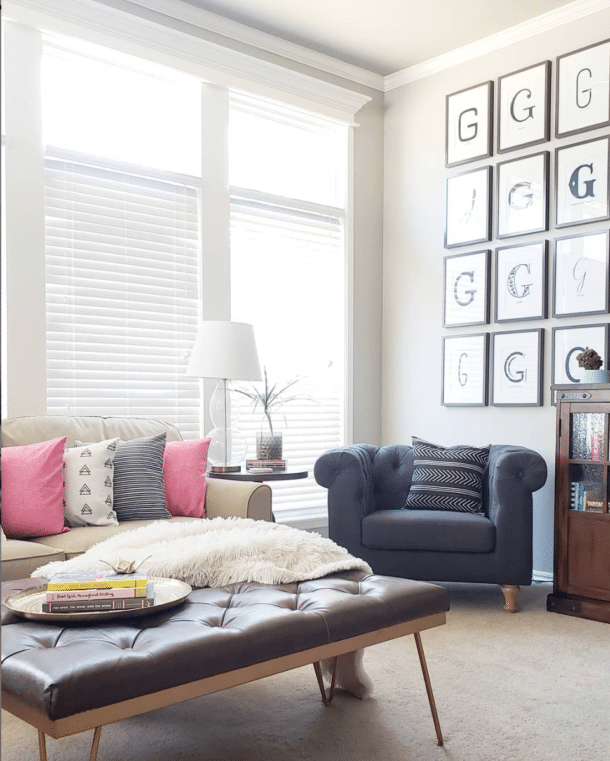 This bedroom from Vanessa Francis is an EXTREME before and after, and my favorite room from the fall One Room Challenge. It’s not complicated or fussy, just fresh and chic! Seeing her before photo gives me hope I can add lots of style to our blah space. While Vanessa’s bedroom captures the fresh, chic feel I want, Angela from Blue i Style captured the style+function angle I also hope to achieve. 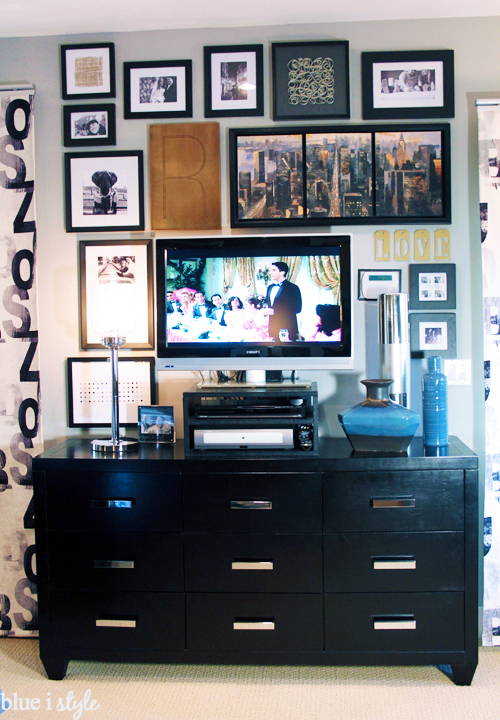 I love creating gallery walls around screens to camouflage them a bit. When Angela’s TV is on (hello there, Ross), it blends into the artwork. If you look closely, there may be a normally unattractive alarm keypad blending in as well. 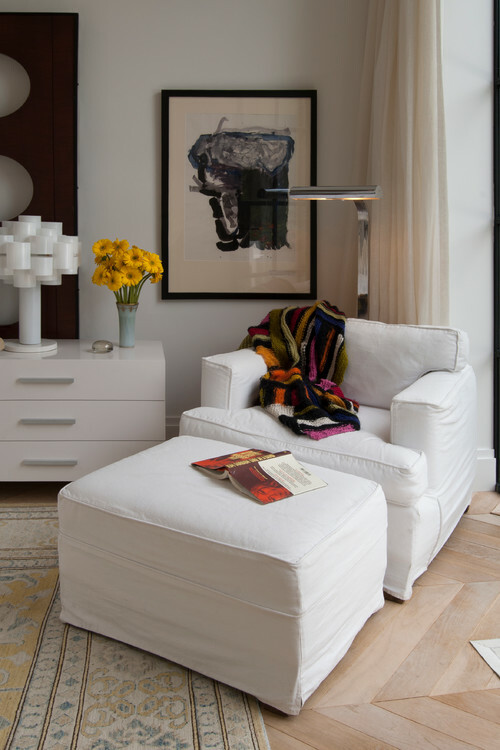 See her whole bedroom here or great tips on a gallery wall here. Also on the functional side, I’m lusting over the thought of a reading nook in the bedroom. The chair below makes me want to curl up with an actual paper book. And the mirror nightstands inspired me so much I gathered up a list of 10 cheap mirrored nightstands options here. This one looks pretty cozy too! 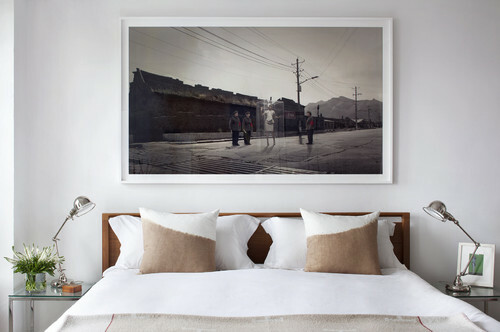 For artwork, I’m getting lots of inspiration from large-scale pieces over beds. We’ve got a DIY project in mind for this part! After ten years with a wooden footboard that seems to jump out and force me to run into it constantly, a soft upholstered bed is high on my wish list. Maybe something like this? So, if you threw all those inspiration photos in a blender, along with a dash of navy and a splash of pink, you might come up with something close to our plans for the bedroom. Many details are still up in the air, but with some luck, it will all come together. Oh yeah, I’d vote for a reading chair over an exercise bike any day! Some may argue that you could read while biking, but I’m on your side with this one! Great inspiration! 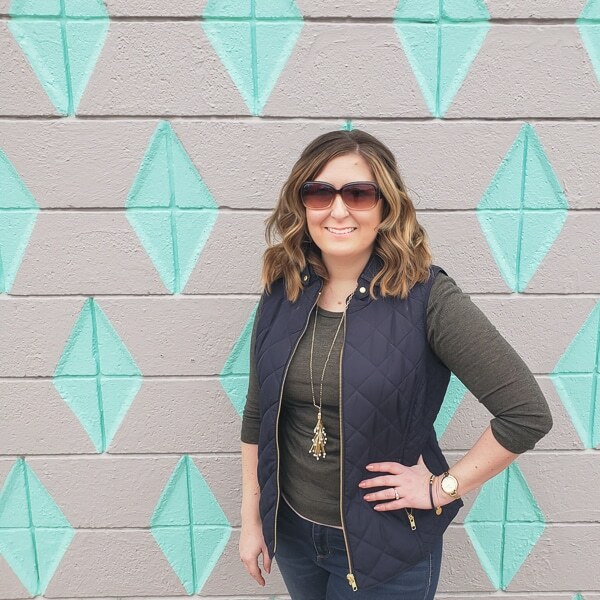 We are about to tackle our master bedroom and I got lots of ideas! My fave being the gallery wall around the tv! Thanks for sharing! So nice. Great inspiration! I got lots of ideas! Thanks for sharing! 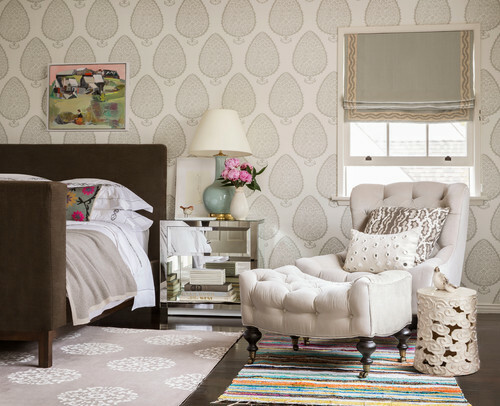 I’m also in love with Vanessa’s bedroom palette … sigh … one day soon!